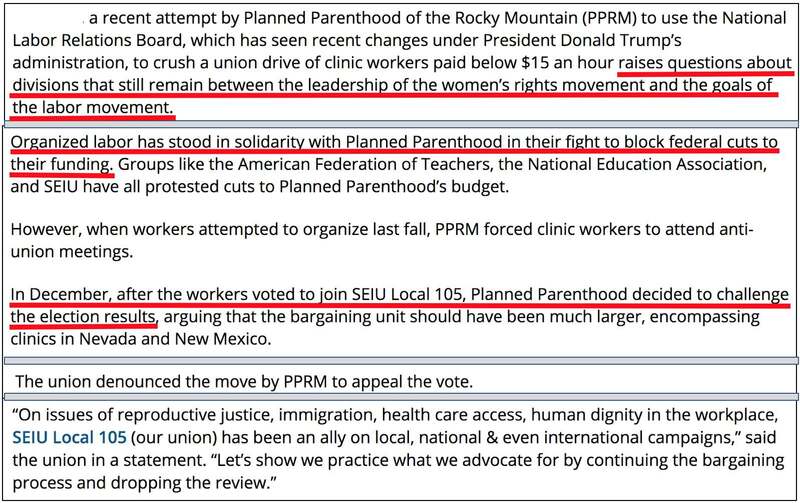 The establishment press, which never seems to miss a chance to highlight conflict among Republicans and conservatives, is ignoring a major dispute involving two of the left's most prominent organizations: The SEIU and Planned Parenthood. The union has tried to organize workers at the Rocky Mountains affiliate of the nation's largest abortion provider. Planned Parenthood is not pleased with the unionization effort, and has run to — get this — the Trump administration's National Labor Relations Board in an attempt to stop it. None of this is news at national establishment press outlets, or even at the local Denver Post. The conflict first became visible in late May at Payday Report, a blog run by Mike Elk, a longtime organized labor-supporting reporter. 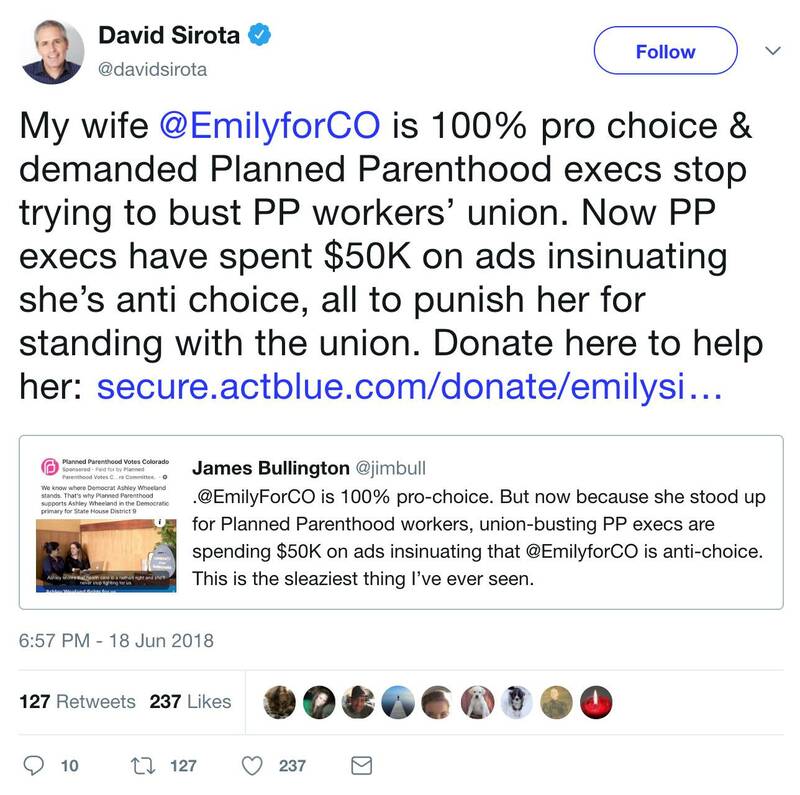 Elk considers Planned Parenthood's run to the NLRB to broaden what an employer considers the correct scope of an employee group — while publicly claiming that it is "not currently opposing efforts to organize our affiliate" — a common union-busting tactic. This move certainly undercuts PPRM's claim that it's "currently not opposing" the union. This is obviously a newsworthy conflict, demonstrating once again that the interests of organized labor are being sacrificed to further other agenda items the left considers more important. The left wants PPRM to keep performing as many abortions as possible, and thus opposes the union to ensure that it will be able to perform its sacred (in their view) but heinous rite at the lowest prices possible. Organized labor has also taken it on the chin in recent decades from environmentalists determined to stop any and all pipeline and other energy-related construction, thereby keeping often union-represented workers from gainful employment, and from aggressive immigration activists who have helped flood the country with cheap blue-collar labor, causing otherwise competitive union-represented factories and other operations to shut down. It's clear that the establishment press considers noticing conflicts on the left counterproductive. That explains why, despite several instances of coverage and commentary at leftist blogs, early Tuesday evening searches on "Planned Parenthood" (in quotes where helpful, all going back to before Elk's post excerpted above) at the Associated Press, the New York Times, and even the Denver Post all returned no the PPRM-SEIU dispute-related results.